Visual Studio 2010 and the ..NET Framework 4.0 will soon be in beta and there are some excellent new features that we can all get excited about with this new release. Along with Visual Studio 2010 and the .NET Framework 4.0 we will see version 4.0 of the C# programming language. In this blog post I thought I'd look back over where we have been with the C# programming language and look to where Anders Hejlsberg and the C# team are taking us next. In 1998 the C# project began with the goal of creating a simple, modern, object-oriented, and type-safe programming language for what has since become known as the ..NET platform. Microsoft launched the .NET platform and the C# programming language in the summer of 2000 and since then C# has become one of the most popular programming languages in use today. 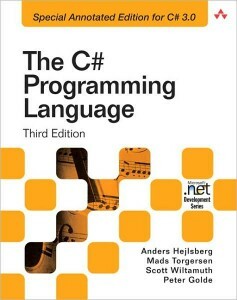 If you're in need of learning about, or distilling knowledge of, any of these language features that I have mentioned so far I would highly recommend that you take a look at the C# Programming Language by Anders Hejlsberg, Mads Torgersen, Scott Wiltamuth, and Peter Golde. What is excellent about this edition is that it contains annotations from many other Microsoft employees and Visual C# MVP's giving you additional perspectives on the language and its capabilities. 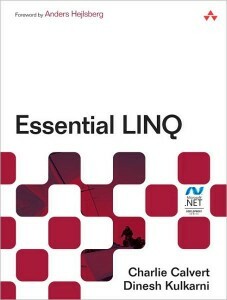 Another excellent book is Essential LINQ by Charlie Calvert and Dinesh Kulkarni. In the past programming languages were designed with a particular paradigm in mind and as such we have languages that were, as an example, designed to be either object-oriented or functional. Today however, languages are being designed with several paradigms in mind. In version 3.0 the C# programming language acquired several capabilities normally associated with functional programming to enable Language Integrated Query (LINQ). In version 4.0 the C# programming language continues to evolve, although this time the C# team were inspired by dynamic languages such as Perl, Python, and Ruby. The reality is that there are advantages and disadvantages to both dynamically and statically typed languages. Another paradigm that is driving language design and innovation is concurrency and that is a paradigm that has certainly influenced the development of Visual Studio 2010 and the .NET Framework 4.0. See the MSDN Parallel Computing development center for more information about those changes. I'll also be blogging more about Visual Studio 2010 and the .NET Framework 4.0 in the next few weeks. In the above example we are declaring a variable, calc, whose static type is dynamic. Yes, you read that correctly, we've statically typed our object to be dynamic. We'll then be using dynamic method invocation to call the Add method and then dynamic conversion to convert the result of the dynamic invocation to a statically typed integer. You're still encouraged to use static typing wherever possible because of the benefits that statically typed languages afford us. Using C# 4.0 however, it should be less painful on those occassions when you have to interact with dynamically typed objects. Another major benefit of using C# 4.0 is that the language now supports optional and named parameters and so we'll now take a look at how this feature will change the way you design and write your code. One design pattern you'll often see as that a particular method is overloaded because the method needs to be called with a variable number of parameters. Let's assume that we have the following OpenTextFile method along with three overloads of the method with different signatures. Overloads of the primary method then call the primary method passing default values in place of those parameters for which a value was not specified within the call to the overloaded method. If you have ever written any code that performs some degree of COM interoperability you have probably seen code such as the following. When performing COM interoperability you'll notice that you are able to omit the ref modifer although the use of the ref modifier is still required when not performing COM interoperability. With previous versions of the technologies it was necessary to also ship a Primary Interop Assembly (PIA) along with your managed application. This is not necessary when using C# 4.0 because the compiler will instead inject the interop types directly into the assemblies of your managed application and will only inject those types you're using and not all of the types found within the PIA. The final language improvement that we will explore is co-variance and contra-variance and we'll begin by exploring co-variance with .NET arrays. Since version 1.0 an array in the .NET Framework has been co-variant meaning that an array of strings, for example, can be passed to a method that expects an array of objects. As such the above array can be passed to the following Write method which expects an array of objects. Unfortunately arrays in ..NET are not safely co-variant as we can see in the following code. Assuming that the objects variable is an array of strings the following will succeed. Although if an attempt is made to assign an integer to the array of strings an ArrayTypeMismatchException is thrown. Generics with C# 4.0 now support safe co-variance and contra-variance through the use of the in and out contextual keywords. Let's take a look at how this changes the definition of the IEnumerable<T> and IEnumerator<T> interfaces. Because the IEnumerable<out T> interface uses the out contextual keyword the compiler can reason that the above assignment is safe. Although the current CTP build of Visual Studio 2010 and the .NET Framework 4.0 has limited support for the variance improvements in C# 4.0 the forthcoming beta will allow you to use the new in and out contextual keywords in types such as IComparer<in T>. The .NET Framework team is updating the types within the framework to be safely co- and contra-variant. I've listed here some resources you might find useful in exploring the capabilities of the C# 4.0 programming language and would encourage you to also download and install the beta once it is available in the coming months.